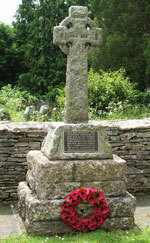 Two war memorials are located within Chedworth. Details of both are shown on this page. In proud memory of the Chedworth men who gave their lives for their country in the Great War MCMXIV-XIX. 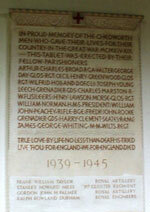 This War Memorial was originally dedicated in July 1920 at the former Congregational Chapel. It was rededicated here in July 1996 and also serves as a commemoration of the chapel community, its Chapel and the Old Manse.